Russell Ronald Reno III is the editor of First Things magazine. He was formerly a professor of theology and ethics at Creighton University. A theological and political conservative, Reno was baptized into the Episcopal Church as an infant and grew up as a member of the Church of the Redeemer in Baltimore, Maryland. 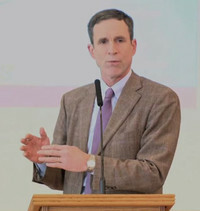 As an adult he was an active participant in the Episcopal Church, serving as Senior Warden of the Church of the Resurrection in Omaha, Nebraska from 1991–1995, as deputy to the General Convention of the Episcopal Church in 1993, 1996, and 1999, and as a member of the Theology Committee of the Episcopal Church's House of Bishops from 2001-2003. On September 18, 2004, he was received into the Roman Catholic Church. Is this you? Let us know. If not, help out and invite R.R. to Goodreads.